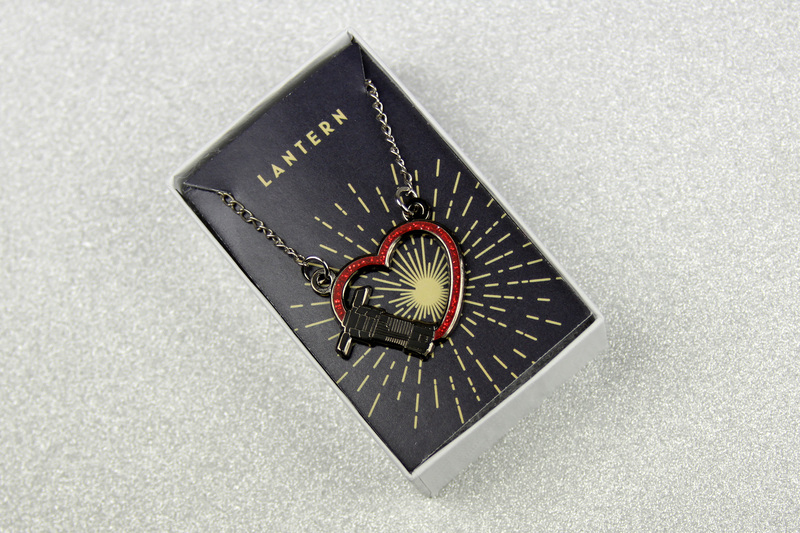 Today’s review features the gorgeous Kylo Ren ‘Moody Love’ necklace by Lantern Pins. This creative design combines Kylo Ren’s lightsaber hilt with a red glitter heart ‘blade’ – perfect for Kylo Ren fans, Dark Side fans, or anyone who wants to show off their love of Star Wars! 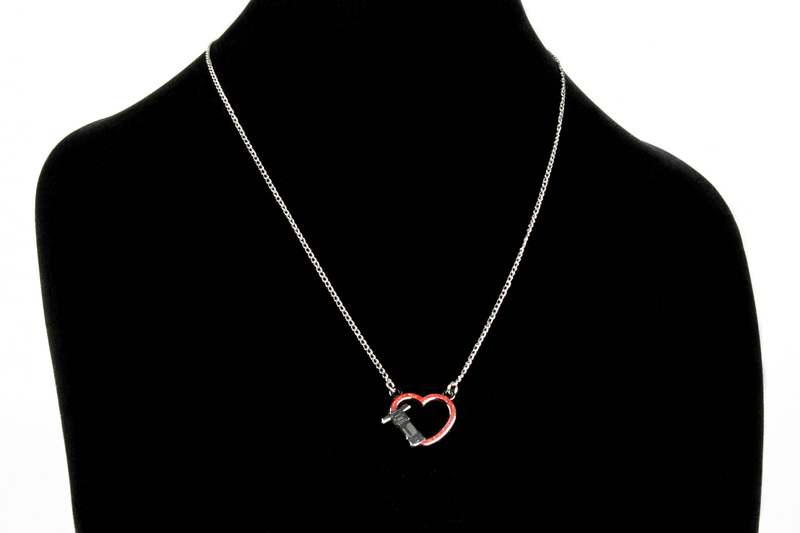 Show your love for the Dark Side with this 1 inch wide, heart-shaped, hard enamel necklace. The center is cut out so you can layer it and show what is underneath. Every Force user in your life needs this ultimate Dark Side necklace. It’s so cute, you won’t mind when someone tells you that you aren’t your grandfather. Each heart is 1″wide and hangs centered on a 19″ long chain. Hand assembled and packaged in a gift box with love! The necklace is priced at US$15.00 each – Lantern Pins can ship internationally, which is great! 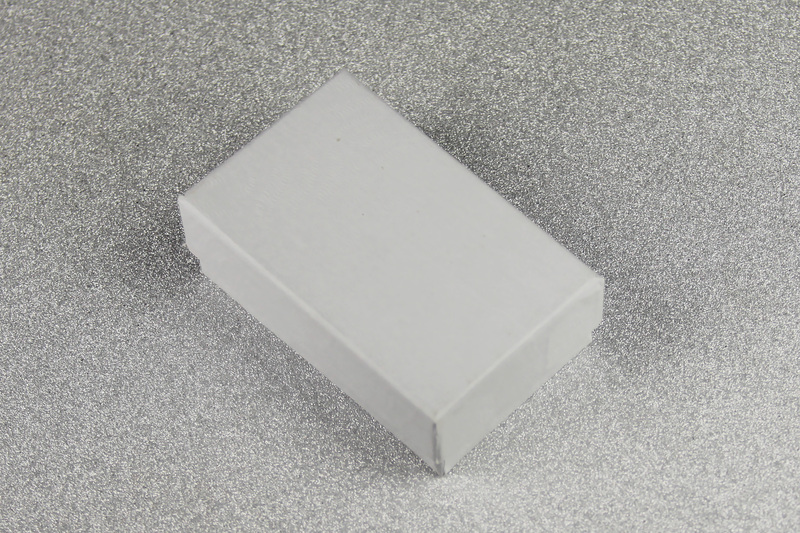 The necklace came packaged in a cute little white cardboard box. 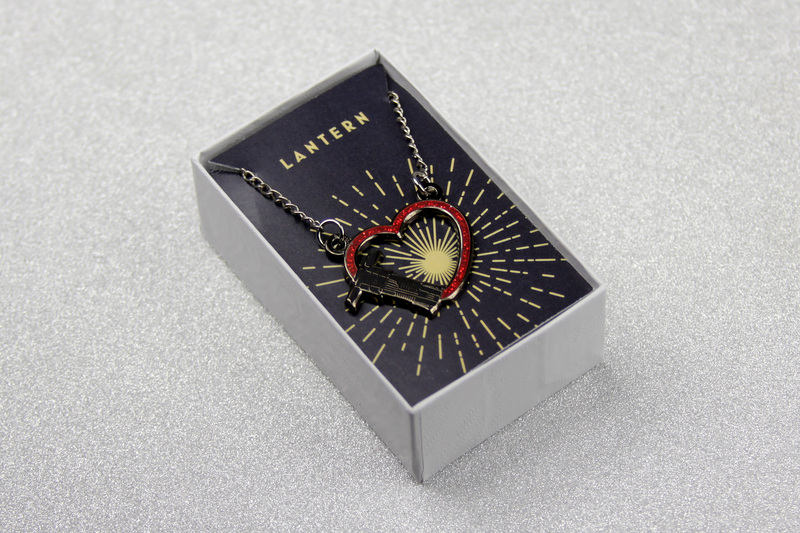 Taking off the top lid, the necklace is presented on a branded Lantern Pins backing card, with a starburst printed design. The necklace is held onto this insert card with the necklace chain passing through two slits in the top of the card, with the rest of the chain stored behind. The insert card is resting on a soft polyester fill insert, so the necklace/backing card stays in place. This is a lovely presentation, whether you are buying this as a gift for someone, or a little treat for yourself. I love the placement of the starburst design on the backing card – it adds a little bit of excitement to opening up your new jewelry! 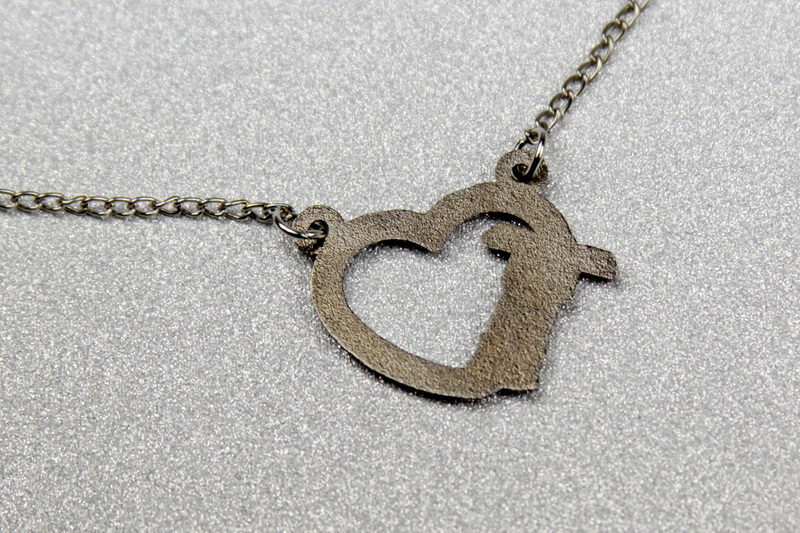 The ‘Moody Love’ necklace features a heart-shaped pendant, with a cut-out center. The left side of the heart also features Kylo Ren’s lightsaber hilt, so that the red heart forms the lightsaber blade emitting from the hilt. Of course one of the main details of this necklace is the red glitter! 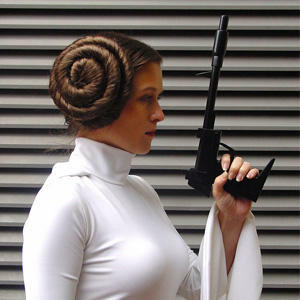 I love a little bit of sparkle with my jewelry, and this details works perfectly with a lightsaber design. The glitter isn’t too loud or overdone, but gives a wonderful ‘lightsaber blade’ effect to the design. The glitter is sealed inside the red enamel, so it has a smooth surface (not rough or exposed). The detail on this pendant is excellent, even when viewed up close. The detail lines on the lightaber hilt are very clear, and stand out well against the black background – the lines are raised just slightly, so you can feel the detail with your fingers. The back of the necklace has a textured finish, in the same dark gunmetal colour as the front of the pendant. 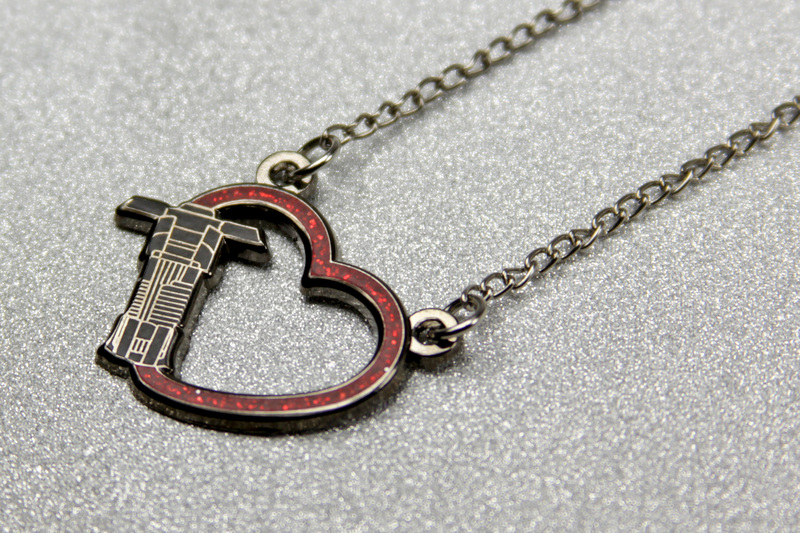 The pendant measures approximately 2.4cm wide at the widest part of the ‘heart’, or 2.7cm including the lightsaber crossguard, and approximately 2.1cm high (not including hanger rings). 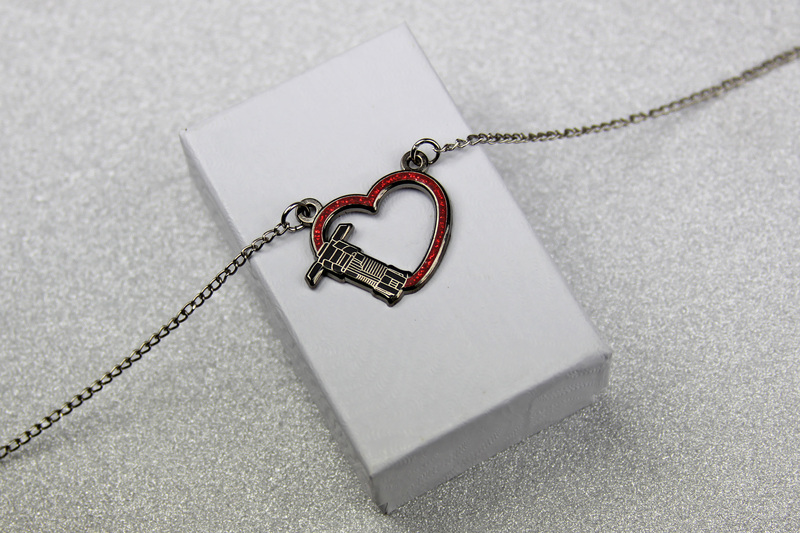 The pendant is attached to the necklace chain with two rings – one on each side of the top of the heart pendant. This style of attachement ensures the pendant stays level when worn, and doesn’t swing around. The chain is a standard silver-tone colour, which coordinatelys nicely with the darker silver colour of the pendant. 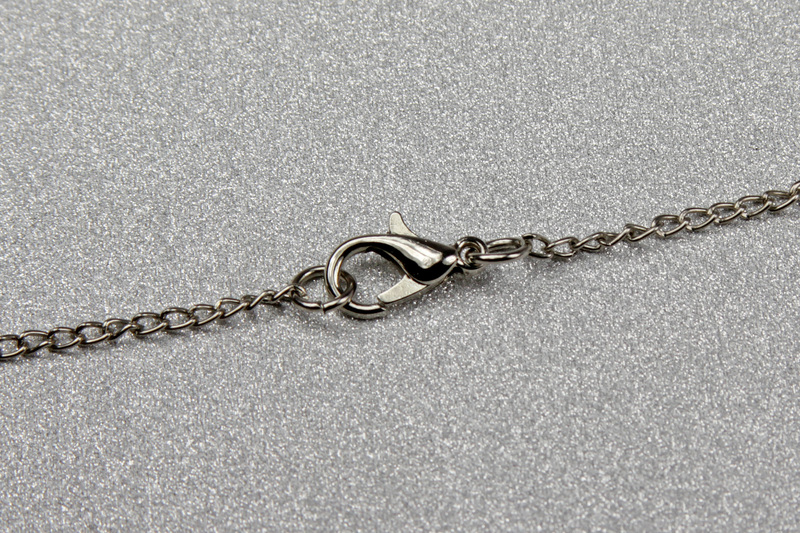 The necklace has a standard ‘lobster claw’ style clasp, with a set necklace length of 19″. 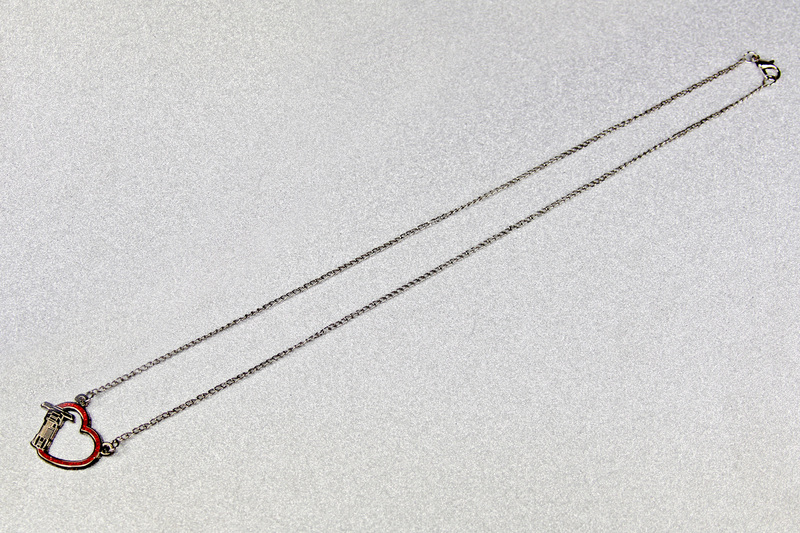 This necklace does not have a length of adjustment chain, which is fairly standard with double-hanger pendants. If this necklace had adjustment chain, it would affect the way the pendant would hang, or expose the clasp on one side of your neck. I think the chain length is perfect for this necklace style, and it’s nice to see that the length of chain is the same on both sides, which keeps the clasp neatly at the back of your neck when wearing. Lightsabers are a popular theme for Star Wars jewelry, but they are often used in, shall we say, less imaginative ways – a standard lightsaber shaped pendant. 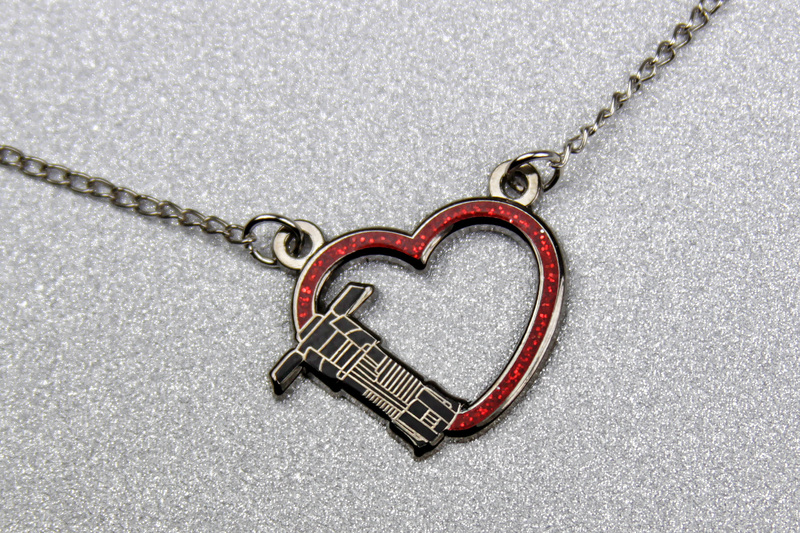 This Moody Love necklace takes the idea of a lightsaber pendant and gives it a really creative twist. I mean, if you’re wearing Star Wars jewelry, you obviously want to show your love of Star Wars! Combining the idea of a lightsaber blade curved into a loving heart shape – fantastic! I am absolutely loving the growing trend of pin-makers expanding into jewelry design! As much as I love Star Wars pins, I have more use for jewelry on a day-to-day basis. Lightsabers are such a core theme in the Star Wars saga, so they make for a great basis for jewelry – this creative design by Lantern Pins is a must-have for anyone who loves Kylo Ren! Lantern Pins also offers this design as a pin, available in plain red or glitter red – check it out here. 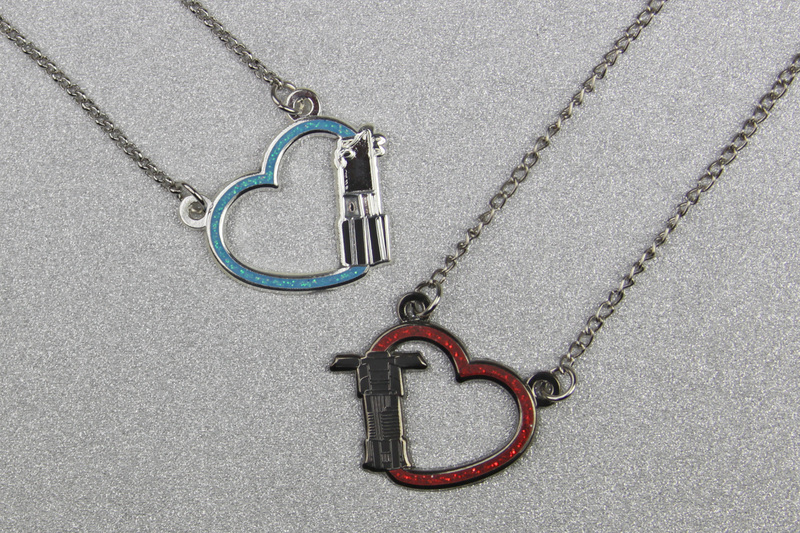 Lantern Pins also makes a Rey inspired lightsaber heart necklace – stay tuned for a review coming soon! Disclaimer: this item was supplied by Lantern Pins for review purposes. The Kessel Runway stands by the position that this, and all of our reviews, are an honest analysis and opinion regardless of whether the merchandise was purchased or supplied by a manufacturer/retailer.